A founder of U.S.-Mexico border studies, José David Saldívar is a leading figure in efforts to expand the scope of American studies. 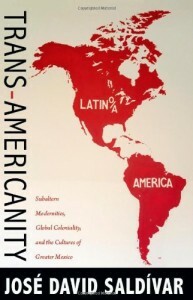 In Trans-Americanity, he advances that critical project by arguing for a transnational, antinational, and “outernational” paradigm for American studies. Saldívar urges Americanists to adopt a world-system scale of analysis. “Americanity as a Concept,” an essay by the Peruvian sociologist Aníbal Quijano and Immanuel Wallerstein, the architect of world-systems analysis, serves as a theoretical touchstone for Trans-Americanity. In conversation not only with Quijano and Wallerstein, but also with the theorists Gloria Anzaldúa, John Beverley, Ranajit Guha, Walter D. Mignolo, and Gayatri Chakravorty Spivak, Saldívar explores questions of the subaltern and the coloniality of power, emphasizing their location within postcolonial studies. Analyzing the work of José Martí, Sandra Cisneros, Toni Morrison, Arundhati Roy, and many other writers, he addresses concerns such as the “unspeakable” in subalternized African American, U.S. Latino and Latina, Cuban, and South Asian literature; the rhetorical form of postcolonial narratives; and constructions of subalternized identities. In Trans-Americanity, Saldívar demonstrates and makes the case for Americanist critique based on a globalized study of the Américas.